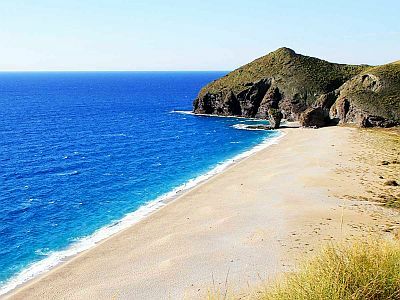 Along the Costa de Almería, the portion of the Spanish southern coast in the province of Almería, the climate can be considered as Mediterranean, in fact, is has mild, relatively rainy winters and hot, sunny summers. However, the aridity is remarkable, so much so that the landscape is desert. There are several beaches that are located in a rocky and arid environment. 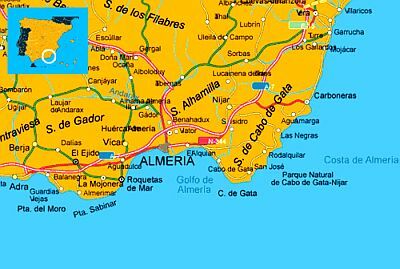 Geographically, the Costa de Almería is divided in a western part (called Poniente Almeriense, where there are towns like Adra, El Ejido, Berja, Roquetas de Mar, Almerimar, Enix and the nature reserve of Punta Entinas-Sabinar), a central part (where we find the Bay of Almería with the capital city, in addition to Cabo de Gata and Nijar), and an eastern part (Levante Almeriense, where we can find the towns of Carboneras, Mojacar, Garrucha, Vera, Pulpí, Cuevas del Almanzora, Villaricos). In the east, a short distance from Carboneras, there's the small island called Isla de San Andrés. In the central part, we find the Cabo de Gata-Nijar Natural Park. In the interior, north-west of Almería, we find the Tabernas Desert. There are many sunny days, with daytime temperatures reaching or exceeding 20 °C (68 °F) even in winter. In winter, very cold days are rare, but on colder periods the minimum temperature can drop to about 0 °C (32 °F); in practice, it never snows. In summer, the heat is generally bearable and sea breezes blow, but there may be periods of intense heat, during which temperatures can even reach 38/40 °C (100/104 °F). Here are the average temperatures of Almería. The rains in the Costa Almería are decidedly scarce, since they are usually lower than 300 millimeters (12 inches) per year, and follow the Mediterranean pattern, in fact, most of them fall from October to April, while in summer it almost never rains. Not surprisingly, the landscape is often desert even on the coast. In Almería, in the wettest month, December, just 30 mm (1.2 in) of rain fall. In the Cabo de Gata area, precipitation drops below 200 mm (8 in) per year. This is the average rainfall in Almería. The amount of sunshine in the Costa Almería is very good in summer, when clear skies prevail, it is good in spring, when cloudy periods are still possible, while it is decent also in autumn and winter, when in addition to sunny periods, which in any case can occur also in this season, cloudy days occur quite frequently. There are on average six hours of sunshine per day even in December and January. In the Costa Almería, the sea is slightly cooler in the western part than in the east: the water temperature in the capital is 24 °C (75 °F) in August, while in July it's still "only" 22 °C (72 °F). In the eastern part, where the coast is exposed to the southeast and is farther from the Atlantic Ocean, the sea in summer is a bit warmer, so much so that in Mojacar it reaches 25 °C (77 °F) in August. Here are the average sea temperatures in Mojacar. The best time for a beach holiday in the Costa Almería is summer, from June to August. The water temperature, especially in the eastern part, is comfortable enough July to September, although in September, which overall is still a good month (especially in the first half), the first Atlantic fronts begin to show up. May and June are sunny months, but the sea is still a bit cool, especially in May, when it is actually a bit cold. Even though good weather is not always guaranteed, spring and autumn are ideal for visiting cities and going on excursions to the interior, as in summer the weather can be hot.